In a society where the money goes to the party that steals your attention, distractions are more alluring than ever before. Just take a look at your Facebook feed. It is a never-ending stream of videos, photos, and articles all fighting for your eyes (and more importantly: your click). And that's just one website. So how are we to escape this mass of distractions so large that it seems to have its own gravitational pull? I mean, how could you not watch this? In the 1980s, university student, Francesco Cirillo, was in desperate need of a productivity tool to help him with his studies. He took a kitchen timer that resembled a tomato, set it to 25 minutes, and got to work. At the end of this 25 minute period, he stopped working, set the timer for 5 minutes, and took a break. Thus, the Pomodoro Technique was born. 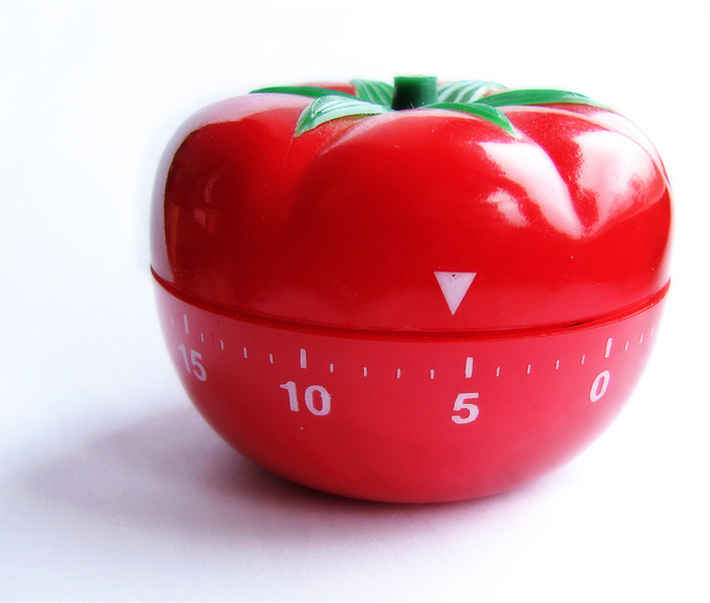 The Pomodoro Technique, named after the Italian word for "tomato", is a time management tool designed to block off periods of work from periods of leisure. With this technique, you don't have to fight the distractions of social media, food, your phone, etc. You still get to indulge in these distractions, but only during a designated time. This makes for extremely efficient blocks of being "in the zone" and can drastically increase the productivity of your work day. Now obviously, you don't need a tomato timer to use the Pomodoro Technique. Any timer can be used, but the distinctive ticking and ringing bell of a kitchen timer can be used to condition your brain into productivity when these sounds are heard. For those of us who work around others, there are also online and mobile versions of the Pomodoro, for use with headphones. My personal favorite is the Pomodoro Timer app for iPhone. Its clean design and authentic sound effects make it ideal for distraction-free workflow. So get a tomato and get productive.